You may have heard of this little game called Borderlands 2. You know, that little game that may just be this fall's most anticipated co-op game. Well, it's out tomorrow, and not only does that mean we get to spend today wishing it was tomorrow, it means launch trailers which painfully remind us how much we are not playing this game right now! The trailer emphasizes the game's story, and apparently we'll be seeing Borderlands 2 characters join forces with Borderlands characters! 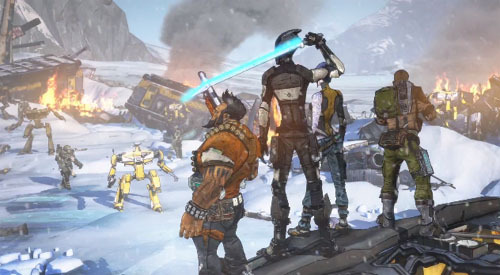 Borderlands 2 is out tomorrow on PC, Xbox 360, and PS3 with 4-player co-op. We'll have our review and co-op FAQ up tonight at Midnight Eastern. Who else can't wait for this? !